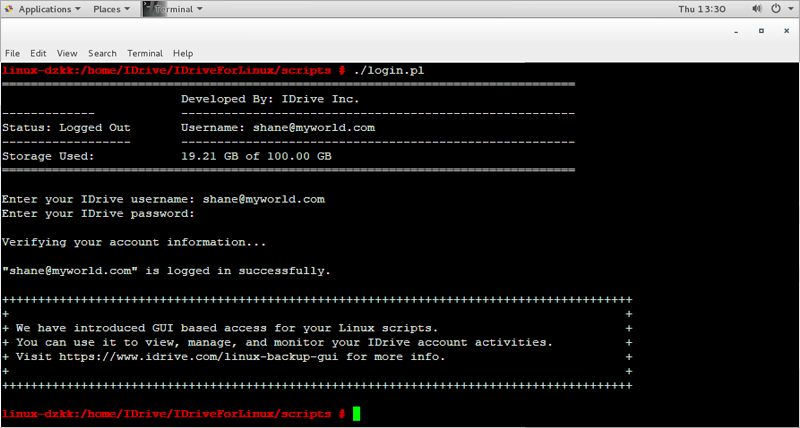 Backup and protect your Linux machine data using scripts bundle provided by IDrive. Protect files during transfer and storage, using 256-bit AES encryption with an optional private key. Download the script bundle from here. Copy or move the downloaded script bundle to desired path in your Linux machine and extract the script bundle using zip or any other available utility in your Linux machine. 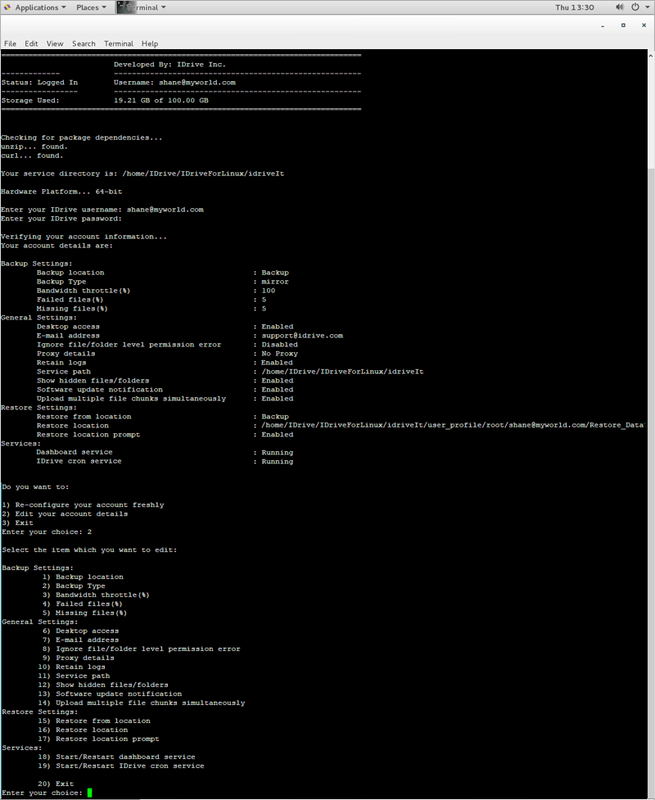 Idrivelib - Contains cron startup routine files for all supported platforms and required perl modules. Other Supported files/folders are used internally by executable script files and users must not try to execute these scripts for any reason. Provide an appropriate permission (executable permission) to the scripts. Note: Setting up the script bundle for the first time will ask user to enter the service path. 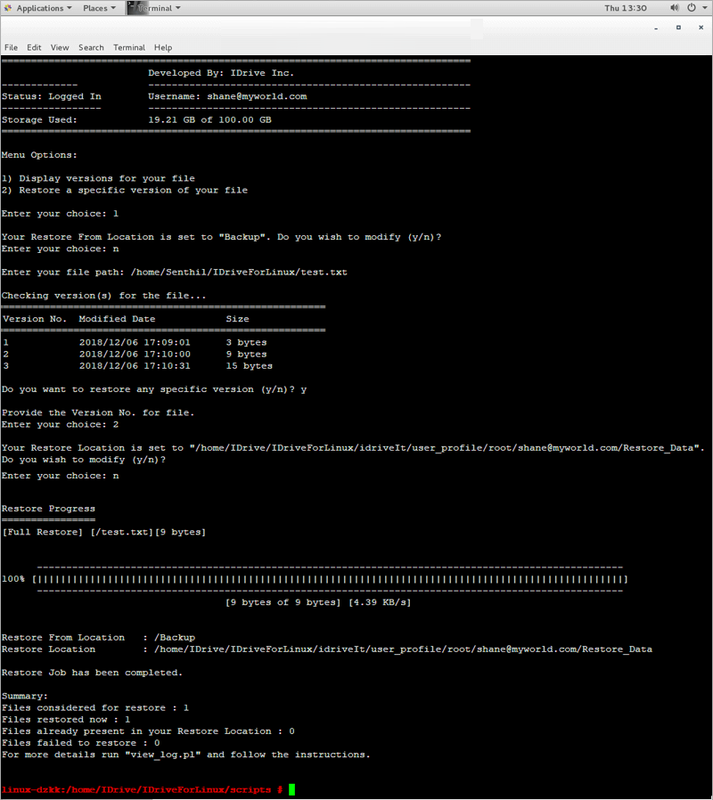 This path will contain user specific data required to perform operations via script bundle. Note: For some IDrive accounts, while configuring account, 'Create new Backup Location'/'Select from existing Backup Locations' options will appear and Mirror/relative backup type option will not appear. If you are not logged in to your IDrive account while setting up your script bundle, run the below command to login: $./login.pl Note: Login script is a mandatory script to be executed before performing any operation. 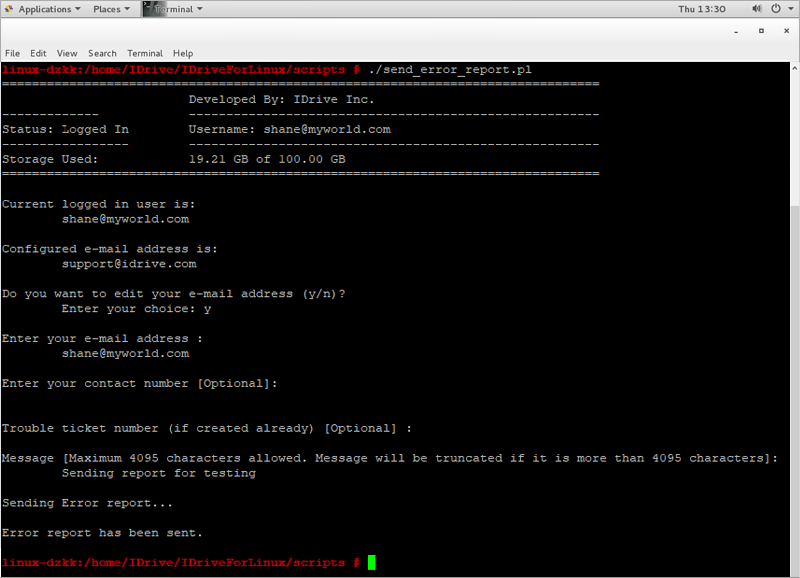 This script will authenticate your IDrive account details and will create a secure session for your backups. Before starting any backup/express backup/restore operation, the user must add the list of files/folders required for each operation in the backup/express backup/restore set file. To update these details in the backup/express backup/restore set file, you must execute the below command: $./edit_supported_files.pl The menu option will be displayed. Select option 1 to edit the backup set file. Respective file will open in text editor to edit. Add the files/folders that needs to be backed up. Using same script you can update backup set, express backup set, restore set and exclude files by selecting the desired option. Exclude Files/Folder from your backup set By using the Exclude option of edit supported file script, you can exclude files/ folders from being backed up to your IDrive account. Run 'edit_supported_files.pl' script and select option 'Edit Your Full Path Exclude List'. 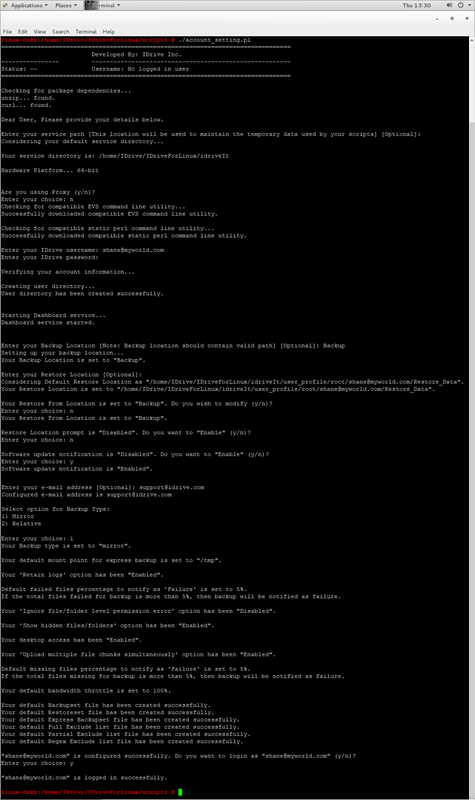 The 'FullExcludeList.txt' file will open in vi editor. Add full path of the files/folders that you wish to exclude. Enter each item in a new line. Your Backupset contains /home/Documents and if you want to exclude /home/Documents/temp, enter the folder path ie: ‘/home/Documents/temp’ in FullExcludeList file. Run 'edit_supported_files.pl' script and select option 'Edit Your Partial Path Exclude List'. The 'PartialExcludeList.txt' file will open in vi editor. Add partial name of the files/folders that you wish to exclude. Example: Your Backupset contains /home/Documents and if you want to exclude all the pst files from this folder like /home/Documents/designtutorials.pst, /home/Documents/new.pst, /home/Documents/James/tutorials.pst etc, then enter ‘pst’ in PartialExcludeList file. Run 'edit_supported_files.pl' script and select option 'Edit Your Regex Exclude List'. 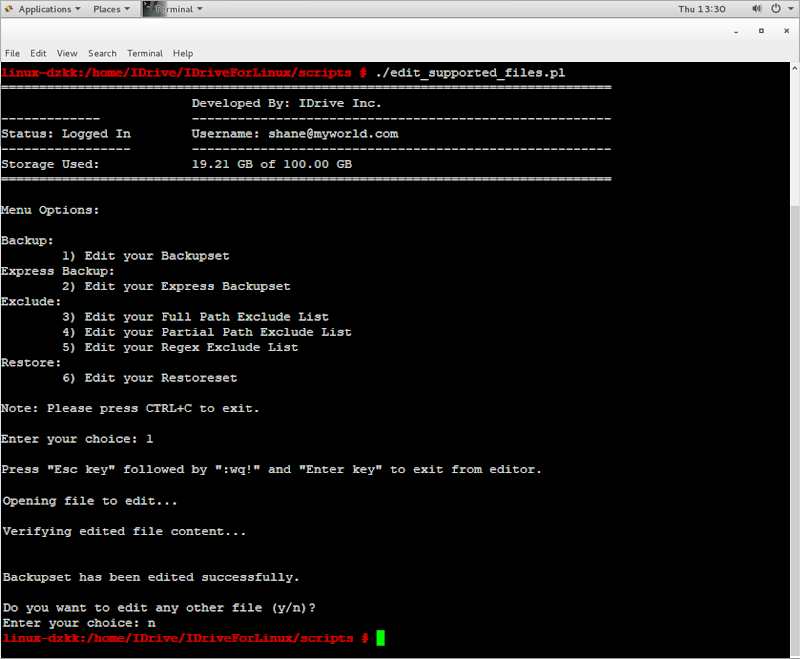 The 'RegexExcludeList.txt' file will open in vi editor. Add the regex pattern of the files/folders that you wish to exclude. Your Backupset contains /home/Folder01 , /home/Folder02, /home/FolderA, /home/FolderB. If you want to exclude all folders/files that contains numeric values in name ie: /home/Folder01, /home/Folder02 etc, then enter ‘\d+’ in RegexExcludeList file. You can perform immediate/manual backup using the below command: $./Backup_Script.pl When you run your backup script, it will reconfirm your backup location and allow you to change it. You can now view the graphical progress bar for your data getting backed up. If you want your script not to ask for backup location and not to display progress bar then you can always use “--silent” flag with this command. Note: For some IDrive accounts this script will not provide an option to change 'Backup location'. You can perform immediate/manual express backup using the below command: $./express_backup.pl Using this script, you can backup your Linux machine data to the express device shipped to you. Once the data is backed up, you can ship this express device back to us and within a week your data will be available in your IDrive account. For more details on express, visit IDrive Express™ for Linux. You can perform immediate/manual restore using the below command: $./Restore_Script.pl When you run your restore script, it will reconfirm your restore and restore from location and will allow you to change it if required. You can now view the graphical progress bar for your data getting restored. If you want your script not to ask for restore location, restore from location and not to display progress bar then you can always use “--silent” flag with this command. Note: For some IDrive accounts, user will not be able to edit 'Restore From' manually and have to select 'Restore From' location from the list of existing locations. Run the below command to manage your schedule backup/express backup/archive cleanup job: $./scheduler.pl Select the desired menu option to create, edit, view or delete your schedule backup / express backup / archive cleanup job and follow the instructions. In case you want your schedule job to stop automatically at a scheduled time then set the cut-off time as well, while following the instructions. You can view the list of previous versions of any file and select any version that you want to restore. To retrieve a file with earlier versions, run the below command: $./restore_version.pl Note: For some IDrive accounts, user will not be able to edit 'Restore From' location manually and have to select 'Restore From' location from the list of existing locations. Archive Cleanup compares the files of your local storage, selected for backup, with the files in your IDrive online backup account. It then deletes the files present in your account but not on your local machine. This feature thus helps you to free up space in your online backup account. To perform archive cleanup run below command: $./archive_cleanup.pl When you run the script to perform archive cleanup, you can enter a percentage of the total no. of files to be considered for deletion. This percentage based control helps to avoid large-scale deletion of files in your account. To end the logged in session for your IDrive account, run the below command: $./logout.pl You must logout (optional) from the account to avoid any unauthorized access to your IDrive account. After logout, you needs to login again to perform most of the operations. 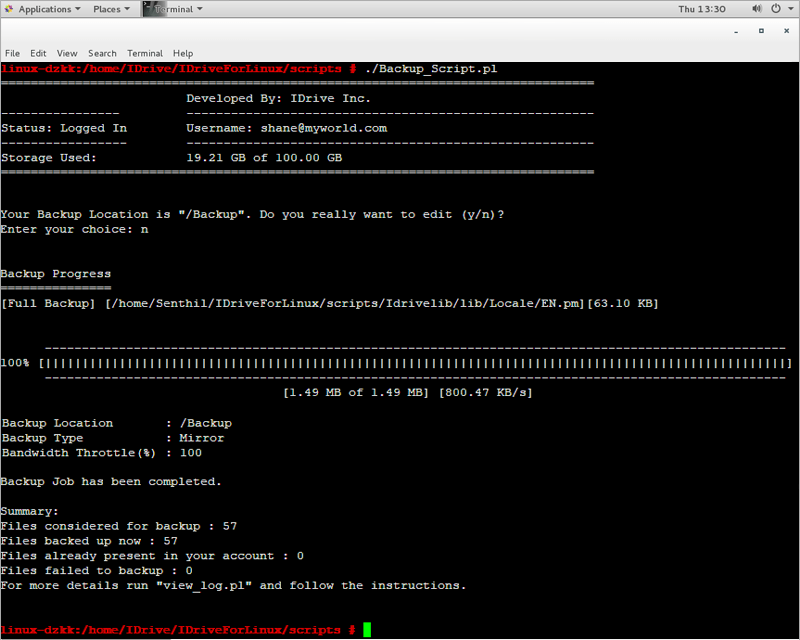 Note: Your scheduled backup / scheduled express backup / periodic cleanup jobs will run even after you log out. Backup Location: Update the backup location using this option. Backup Type: Change the backup type from mirror to relative and vice versa using this option. Bandwidth throttle(%): Set the Internet bandwidth to be used by the scripts for backups using this option. Failed files(%): By default failed files % to notify backup as 'Failure' is set to 5%. If the total files failed for backup is more than 5%, then backup will be notified as failure. Change the default setting using this option. Missing files(%): By default missing files % to notify backup as 'Failure' is set to 5%. If the total files missing for backup is more than 5%, then backup will be notified as failure. Change the default setting using this option. Desktop access: Enable this setting to access your computer via dashboard. E-mail address: Use this option to change the email address provided at the time of account setup locally. Ignore file/folder level permission error: If your backup set contains files/folders that have insufficient access rights, IDrive will not backup those files/folders. Hence in such a case, by default, your backup will be considered as 'Failure'. To ignore file/folder level access rights/permission errors, enable this setting. Proxy details: If you are behind a proxy address, you should update the proxy settings using this option. Retain logs: If you do not wish to retain backup, express backup, restore, archive operation logs locally then disable this option. Show hidden files/folders: Disable this setting to skip hidden files/folders from backup. Software Update Notification: Enable this setting to get a notification for available updates in script header. Upload multiple file chunks simultaneously: Enable this option to upload multiple file chunks simultaneously to improve overall data transfer speed. Service path: Update the service path used by IDrive scripts using this option. Restore from location: Use this option to change the location from where backups will be restored. Restore location: Use this option to change the restore location. Restore Location Prompt: Enable this setting if you wish to receive notification about the restore location before starting restore. 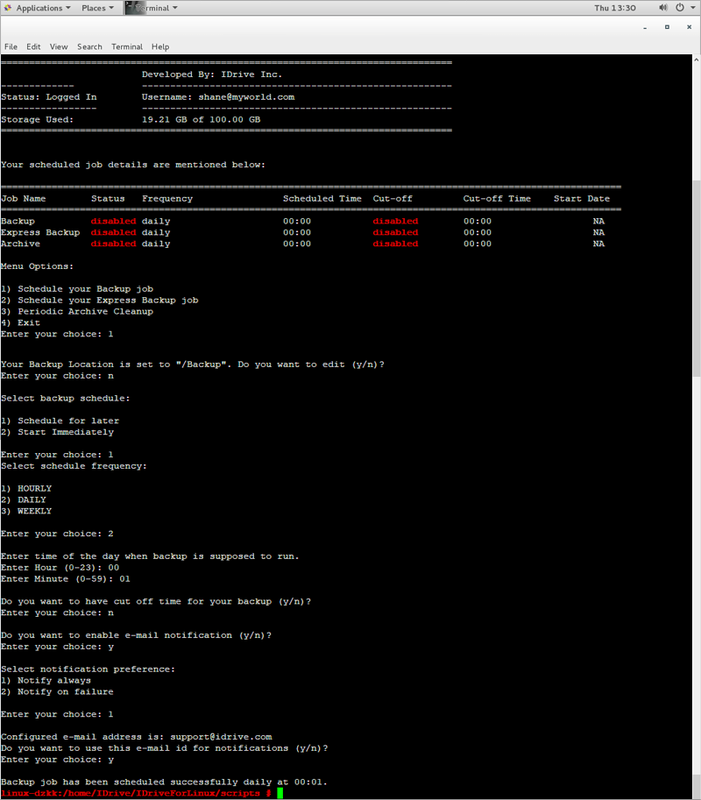 Start/Restart dashboard service: Use this option to start/restart the dashboard service. This service must be up and running for your machine to be remotely managed from the Dashboard. 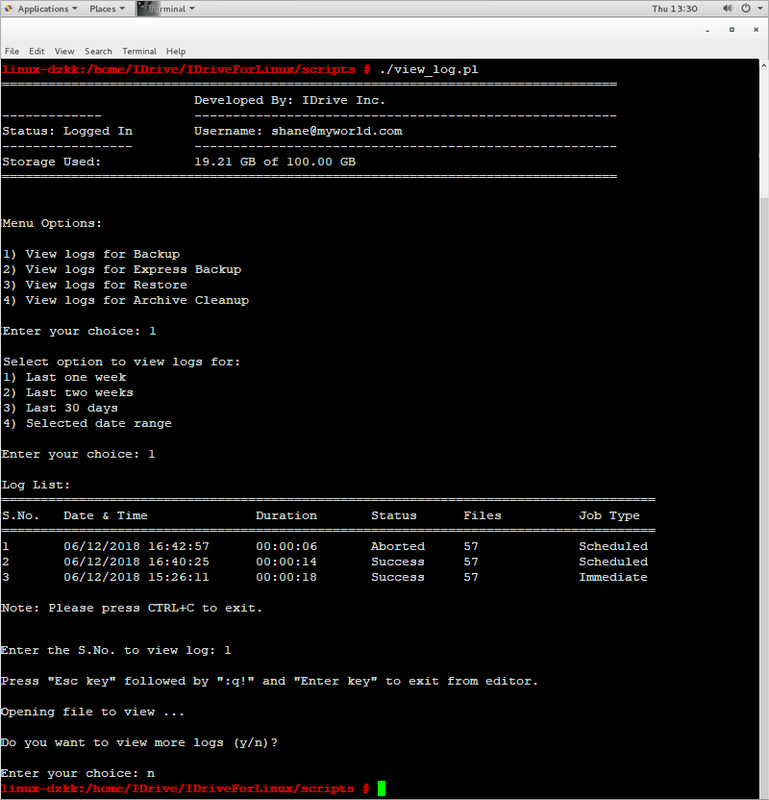 Start/Restart IDrive cron service: Use this option to start or restart IDrive cron service. This service is responsible for all the schedule jobs to work as expected. Select the desired option and follow the instructions. Note: For some users, while re-configuring or editing account, 'Backup Type' will not be displayed and also while editing 'Restore From' location, list of devices will appear. Uninstalling the script package from your system will leave the files/folders of your system liable to digital disasters. To uninstall the script bundle, run the below command and follow the instructions. 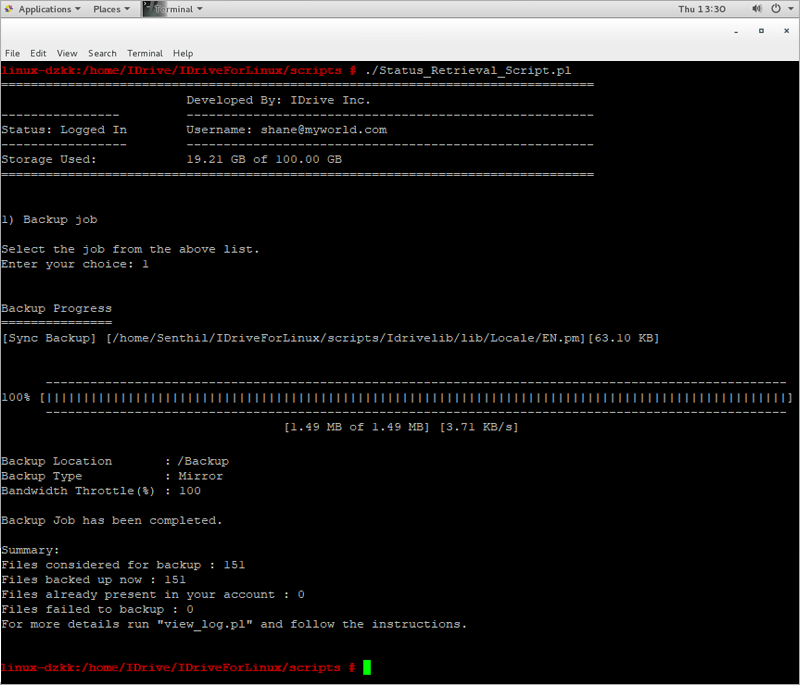 $./Uninstall_Script.pl This script will automatically remove all IDrive package files and other dependency files. It will also stop all IDrive specific services and cleanup the scheduled backup/express backup/restore/periodic cleanup jobs if any.